One of the popular and highest peak of the Sahyadri Ranges is Mt. Kalsubai. 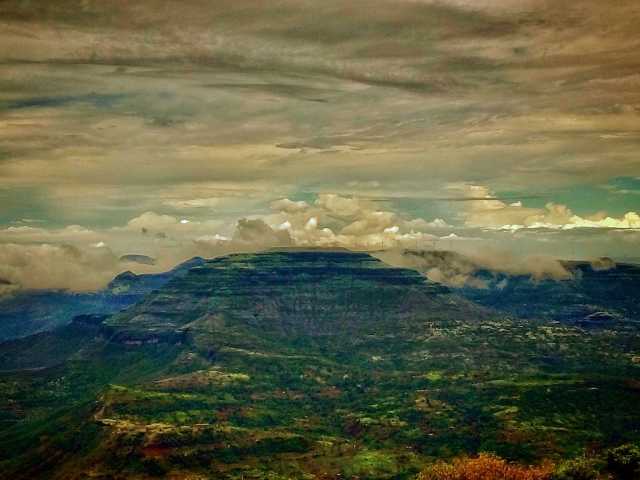 The view of this majestic mountain is an amazing sight in Bhandardara. It is also known as the Everest of Maharashtra, as it is the highest peak in the state. Mt. Kalsubai has a peak height of about 5400 ft. Kalsubai Harishchandragad Wildlife Sanctuary which propagates from Kalasubai to Harischandragad of which Kalsubai Peak is part. Kalsubai Peak is a dream trek of every passionate trekker in Maharashtra to climb it at least once. The trek is a very tricky one and usually the experienced trekkers find their way to the top with some difficulty. There are now man-made stairs to reach the peak if you don't wish to trek. However, the hills near the Kalsubai peak are relatively easier to scale. In rainy season Mt. Kalsubai Peak offers view of astonishing lush green valleys, walk through clouds, bellowing winds, Series of waterfalls it’s all packed into one which makes it one of the most enjoyable trek. Kalsubai is a small temple situated on Kalsubai Peak top. Ratangad, AMK (Alang-Madan-Kulang), Harishchandragad, Ahivant, Saptashrungigad, Markindya, Dhodap, etc. can be spotted from the Kalsubai Peak. 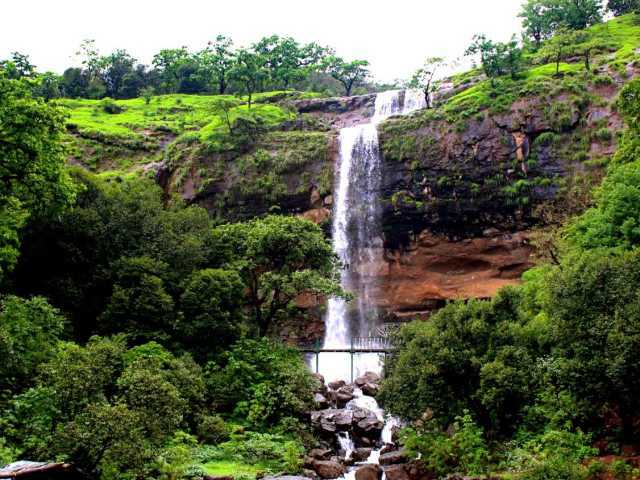 One of the most amazing waterfall attractions in Bhandardara is the Randha Falls of the Pravara River. The clear water of the Pravara River ferociously falls from a height 170ft into a magnificent ravine and creates a breathtaking sight. However, this waterfall is only attractive in the monsoons. Just near the falls is a temple, and there is walkaways around the falls for wonderful view. There are two fall, in the first one, the fall is over several layers of stones, which provides space for people to enjoy the waterfall. This place is generally crowded, people enjoying a dip under the fall. The other waterfall is untouchable, can be viewed only from far away. Around the viewpoint is a deep gorge, with scaly mountains filled with small shrubs. The place is quite big to walk around and enjoy the waterfalls and the gorge from 270 degree angle. The weather remains pleasant, with light intermittent drizzle at times. Arthur lake is a quaint little pool that gets its water from the Pravara river, Surrounded by the lush mountains of Sahyadri ranges. It is a serene place to unwind and soak in the natural beauty. Arthur Lake is an ideal spot for camping swimming in its pristine blue waters. It is mentioned on the Maharashtra Tourism website and is major place of attraction. One can setup up a tent very close to the waters. The local food variety are treated to tourists with a nice meal of hot steaming rice and dal and vegetables, all which were grown locally. Boating is also possible around this Lake. You can dig into the surrounding expanse and try to key out most of the peaks like kalsubai and Ratangad. One can walk around the lake enjoying scenic beauty in lap of nature, in the evening. The ideal time to go is during the winters from October to February. Arthur Lake is an ideal place for a day picnic provided one starts early in the morning which gives the picturesque view of serene beauty around. Ratanwadi is a mansion the popular Ratangad fort and the famous Shiva temple called Amruteshwar which is a village near Bhandardara of the Kalsubai peak in Maharashtra. It is one of the best forts in Maharashtra and an ideal place for trekking. In Bhandardara the Ratangad Fort is one of the most reckoned places to visit and this place leaves visitors spellbound with its rich heritage. The fort is located at a height of 4250 feet. Ratangad has a natural rock peak with a cavity at the top which is called Nedhe or Eye of the Needle. It is a famous trekking spot as it is far from the main town and has a rustic charm to it. It is situated in Ratanwadi which is its base village and overlooks the Bhandardara. The beautiful temple of Amruteshwar carved out of stone, is dedicated to Lord Shiva. It is one of the 12 Shiva temples build in 900AD by King Jhang. Ratangad Fort is 400 years old fort, which was used by Maratha warrior Shivaji. The fort has four gates known as Ganesh, Hanuman, Konkan and Trimbak. There are two caves on the Ratangad Fort, one of the caves is smaller and can accommodate 8-10 people, while the other cave is larger and can accommodate 40-50 people. It also has many wells on the top. The mystical ashram rests peacefully on the bank of the Pravara River. This legendary place finds its reference in the scripts of the Hindu epic Ramayana. There are many mythical stories that are connected to sage Agasti, and in one of stories, the sage gifted lord Rama a miraculous arrow through which he killed Ravana. In accordance with the legends, sage Agasti did staunch meditation here for almost a year, surviving on water and air. This age-old ashram finds its mention in the mythological text of Ramayana. Monsoons and winters would be a pleasant time to visit the area as nearby river would be sworn with water. However, the place is an ideal weekend getaway and thus any day when the weather is fine can be the best time to visit the place. Large number of tourists seeking solace from the maddening crowd of the city gets attracted to this this spot that is naturally blessed with serene beauty and is said to be an ideal place for a weekend getaway. Plan your trip to Bhandardara to visit all the famous places in Bhandardara. traveldglobe.com is your most friendly and accurate online travel guide, this will not only help you plan the your vacation but will also be your personal itinerary planner. 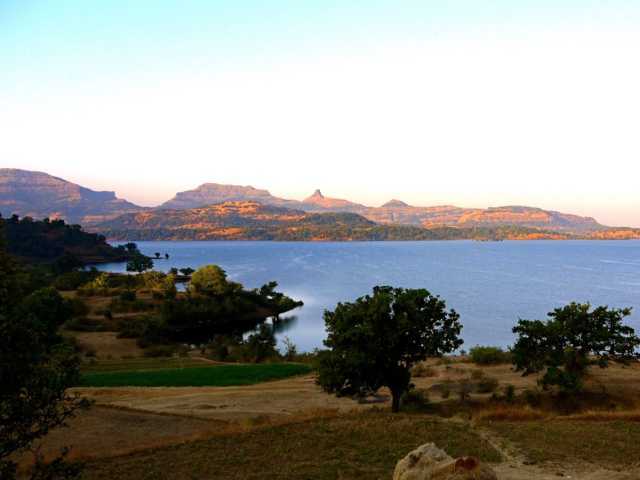 places to see, things to do and explore everything at Bhandardara. You can view the expense or cost of travel, exact location, weather, temperature and time people usually spend to these places. All the places to visit has user reviews that will help you decide and plan better. Bhandara district is a district around central India. The district headquarters are located at Bhandara. It is lovingly called as the 'District of Lakes’. Bhandara town is also known as 'Brass City' owing to the presence of a large brass products industry. The entire region is surrounded by the hills, rivers and dams, and other natural resources. Tourism in Bhandara district comprises visiting a number of places of both religious significance as well as leisure activities. There are ancient sites, such as the Ambagad fort built in 1700 AD or the village of Brahmi or one can travel to Andhalgaon, famous for the weaving industry here especially the Kosa cloth. When looking for rest and relaxation, the places that Bhandara has to offer its tourists are places like Rawanwadi, Koka etc. which are full of scenic beauty.